for the non-artist and artist alike. 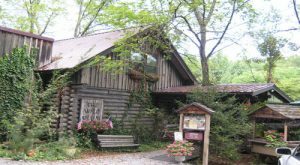 Come enjoy our own 7000 square foot lodge overlooking the Smokey Mountains, a hike to a waterfall, creating & learning new art forms, art journaling, wood working, delicious food, antiquing, live music, uplifting messages, surprises, artisan handcrafted gifts & so much more. To renew, reboot and recharge, through art and nature. This retreat is a special one… designed for a limited number of lucky women. Four days packed with inspiration, adventure, learning and personal growth. A safe place to explore things youâ€™ve never tried before. Experimenting with your hidden creativity. The time spent here will be encouraging and uplifting while stepping out of your box and into self discovery. Share this time with other like-minded women, while friendships blossom. For those of you saying “I don’t have an artistic bone in my body”… this one’s for you. Yes, you do, we’ll find it. * Handmade leatherbound journals, made just for you. You’ll learn new unique techniques & methods for gorgeous art journaling. * A lovely hike and picnic to a dreamy water fall, including a photo shoot. * Enjoy a drive to the mountain top, where you’ll meet Guest Artist Camille. She’ll teach us to make a piece of art using our fingers and creamy pastels, mixing colors and creating depth while overlooking the Smokies. * All meals catered including; full spread bar-b-que, Italian Night and a chocolate fondue wine party. * A few leisurely hours to shop the 8 mile loop full of hundreds of artisans, crafters and antiques shops. * Lunch at the quaint The Wild Plum Tea Room. * Learn super amazing techniques to use on aged wood, including crackle, wood paste, chalk paint and antique wax. * A Girls Night In (to fully enjoy the lodge), including a delicious meal. * Bluegrass/ folk musicians perform live for us at our lodge. * New friendships, evening fireplace sessions, and much, much more. *So many special touches and surprises await. Once you arrive, every detail is taken care of! Camille followed her dream and opened the highly successful Art Studio of the Smokies. She is a graphic artist, illustrator and art educator. She’s very involved in the community and serves on the S.C. Arts Council to promote art through grants and community art events. She’s known for her gentle way of teaching and pulling out the hidden artist in each person. Her greatest joy is when someone completes their work and feels proud of their success. She’s excited to teach the Untethered women painting with pastels, and share the inspiration and beauty of the smokey mountains. * Another option: Road Trip, drive your own car up. No plane or car rental needed. It’s a 10 hour drive from Merritt Island to the lodge. Just a thought. What if I need to cancel my Registration? Any cancellations of the retreat up until December 1, 2016 will result in a return of your payment less a $350 cancellation fee. For cancellations ocurring on or after Dec 1, 2016 we will not be offering any refunds. How does the payment plan work? Submitting your deposit serves as your agreement to attend the retreat and payment in full must be received by Febuary 1, 2017. If your full fee is not received by Febuary 1, 2017, you agree that your deposit will be retained and you will lose your place. Clicking â€œsubmitâ€ on the registration form will take you directly to Paypalâ€™s secure payment site, where you can make your deposit. Once youâ€™ve paid in full you will receive your Personal Retreat Packet. Check-in: April 23, 2017 – check-out: April 27, 2017. Single/Private: Your own room $1500. Double/Shared: Shared room/king bed $1200 each. Food: All meals are included. Catered by the divine Marcia Jordan. Meals from Sunday April 23, 2017 3pm sign in â€“ Thursday April 27th , 2017 10am check out. The Wild Plum Tea Room: We will be going out to lunch at the old world style tea house, The Wild Plum Tea Room. Art Supplies: All art supplies are included for every class. Including your own handmade leather covered journal and prepped aged wood for our woodworking class. You just need to bring a couple of outfits to get messy in. Two inspiring Artists/Instructors: You will spend four days immersed in creativity, inspiration, nature and art. Jeanee will introduce you to the magnificent world of art journaling, introducing you to exciting new art forms to use in your handmade journals. She will share her unique and creative techniques and tips, while we work on aged wood, using crackle, chalk paint, wood putty and antique wax. Overlooking the smoky mountains, Camille, our Guest Artist, will teach you how to use creamy pastels to fingerpaint the view before you. You will go home with pieces of art you created yourself. Music: Tucked away in our lodge on the last night for Girls Night In, we will have a chocolate fondue/wine bar party, and be treated to a live performance by Stephen Goff and the Royals, a Bluegrass/folk musical group. Custom Designed Untethered T-Shirt: You’ll get a unique custom designed Untethered Art Retreat~ Smokey Mountains T-shirt. Worn to the waterfalls for a photoshoot. Treasure Box: You will receive a beautifully handcrafted artisan treasure box, with your name etched in copper. This vessel will fit the daily gift/messages you’ll receive during the retreat. Personal Retreat Packet: You will receive a lovely packet descibing the itenerary and important details, answering all of your questions you will need to know for your retreat getaway. Try and get a flight that arrives sometime in the day or morning of Sunday 23, 2017. Check in at our lodge is 3pm. this will allow you time to get your car, drive to Gatlinburg (1 hour 15 minute ) and explore a bit before checking in to the lodge at 3pm. Car Rental: Car rental from McGhee Tyson Airport in Knoxville, Tennessee is very reasonable, ranging from $15-$25 a day. Majestic Overlook Lodge features 12 luxury king suites each with its own bathroom and deck facing the view. 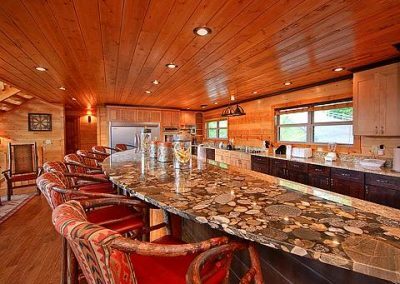 Rustic elegance, stone fireplace, buckskin/ log furniture, a chef kitchen, floor to ceiling windows overlooking an unobstructed view of the smokey mountains. The following is a simple breakdown of what the days will be. The schedule will be fluid and work with us each day. Fly into McGhee Tyson Airport, Knoxville Tennessee. You will rent your car from the airport and drive to Gatlinburg, about 1 hour 15 minutes. Directions will be given to you in your Personal Retreat Packet. ï»¿Another option is to road trip it up, a 10 hour drive from Merritt Island to the lodge. Check-in to Majestic Overlook Lodge is at 3pm. Everyone will start arriving and getting settled in their suites. Snacks will be available and a light dinner will be served around 6pm on. 8 am: Breakfast. A variety of delicious options will be available every morning along with unlimited coffee and teas. 9-12noon: Wear your paint clothes today. Jeanee will start with an introduction and then the magic begins as we start your journey into Art Journaling. You will be given your new handmade art journal and begin to learn how to fill it with inspiration and a variety of art techniques. 12-1pm: Lunch is served at the lodge. 1:30-4pm: We continue glazing, texturing, painting, ripping, sewing, transfering, melting and stamping. So much goodness in one day. 5:30pm: Dinner – Tonight we will have an Italian night. with a delicious meal and dessert. The evening will be spent at the lodge, relaxed, wine, fireplace, getting to know each other. 9-12noon: This morning will be gorgeous as we take a hike to Laurel Falls. A lovely 3 mile round trip hike, it’s rated “moderate”, it’s a paved path, with a steady incline. We will walk at a comfortable pace. 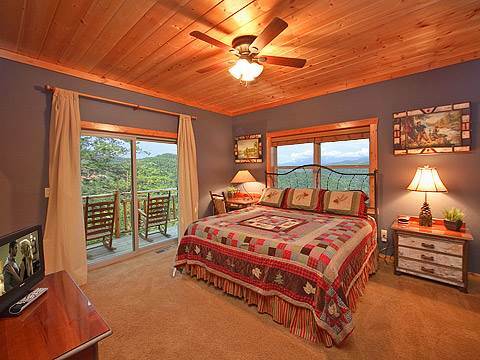 It has a view of the smokies hidden off and on along the way. When we get to the falls, we’ll break out our picnic lunch and enjoy nature at its finest. Make sure to wear comfortable, supportive hiking boots or supportive tennis shoes. Jeanee will do a photo shoot with the group in your custom made Untethered T-shirts. 12-1pm: Arrive back at our lodge to freshen up, paint clothes will be needed again. 2pm – 5pm: We will meet Camille at the designated spot and start your painting adventure, overlooking the Smokie Mountains. She will gently guide you to paint what you see, ending with your own piece of art placed in a mat frame, waiting to be hung at home. 6pm: Dinner: Tonight will be a southern bar-b-que, with slow smoked pulled pork sandwiches and all the fixens, homemade apple pie, a perfect meal with our surroundings. This evening we relax by the fire and unwind after a busy day. We will do a few preparations on your aged wood for tomorrows workshop. 9-12noon: For you antique/art/craft lovers! We will spend a few hours leisurely looking for treasures along the 8 mile loop, full of over 100 local antique/art/crafters. 12 noon: Tucked away at the end of the loop, we will meet at The Wild Plum Tea Room. An old world style teahouse serving artisan local food. 1:30 – 4pm: Back at the lodge, wearing paint clothes again, we will be working on old weathered wood using special techniques; texture, crackle, chalk paint and antique wax, making pieces of art to take home. Check-out: Check-out is at 10 am. You arrange your flight in and out of the McGhee Tyson Airport Knoxville, Tennessee. Where is the location of the Majestic Outlook Lodge? In Gatlinburg, Tennessee. It’s about 1 1/2 hours from the McGhee Tyson Airport. How do I get to Majestic Outlook Lodge? A Personal Retreat Packet will be mailed to you with all of the fine tuning and details once you have paid for the retreat. 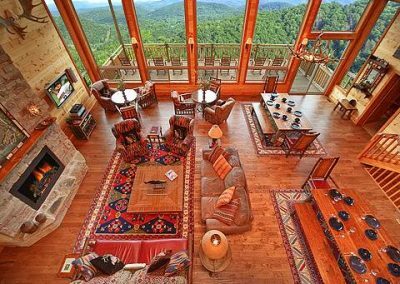 Room accommodations at Majestic Overlook Lodge, where will I stay? 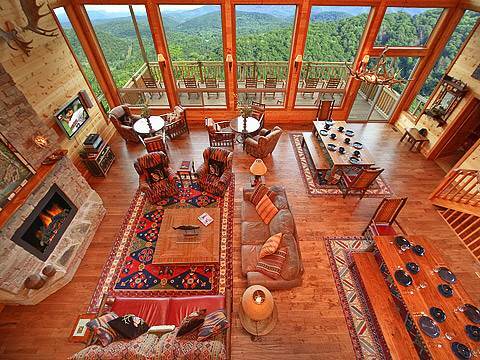 The Majestic Overlook Lodge is a 12 bedroom suite/12 bathroom Lodge. You can choose to have your own private room, or share it with a friend. If you choose to share, you will be sharing a king size bed. What will the temperature be? In April it can be anywhere between 50-80 degrees. Delightful. What should I wear? Dress casual and comfortable. We will be going on one hike, so supportive shoes would be nice to have, also a back pack for the hike. Bring layers for the mornings and evenings. Bring some clothes that you donâ€™t mind getting messy while we are creating. Will there be shopping? The only shopping that we will be doing is on Wednesday, when we explore the antique/arts/crafters 8 mile loop. On this day, you will hopefully find some treasures. The rest of the time is spent, enjoying the magnificent lodge, nature, food, friendships and creating. Breakfast includes: A nice variety of choices will be avaiable for you. Granola, yogurt, toast, english muffins, fresh fruits, eggs and veggies. Marcia will be cooking something each morning. And of course unlimited coffee or tea. Lunch includes: Seasonal salads, pasta salads, quiche, wraps. etc. Snacks are available throughout the day; fruit, nuts, almond butter/peanut butter, chocolates and unlimited coffee, teas. What are meal options for special dietary needs? Let us know and we will try to accommodate your needs. Can I arrive early and stay late to the Retreat? The lodge is booked before us and after us, but if you wanted to stay somewhere else, that’s totally up to you and you would make those arrangements. What if I need to cancel my Registration? Any cancellations of the retreat up until December 1, 2017 will result in a return of your payment less a $350 cancellation fee. For cancellations ocurring on or after December 1, 2017 we will not be offering any refunds. How does the payment plan work? Submitting your deposit serves as your agreement to attend the retreat and payment in full must be received by Febuary 1, 2017. If your full fee is not received by Febuary 1, 2017, you agree that your deposit will be retained and you will lose your place. Clicking â€œsubmitâ€ on the registration form will take you directly to Paypalâ€™s secure payment site, where you can make your deposit. Once youâ€™ve paid in full you will receive a Personal Retreat Packet. Car Rental: You will need to arrange your car rental from Mcghee Tyson Airport in Knoxville, Tennessee.